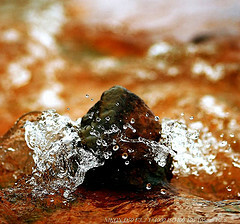 When given enough time, even a slow, constant dripping of water can cut through rock. I was recently reminded of this example while listening to the Dave Ramsey show a couple of weeks ago. Dave was using this as an example of what it takes to be successful at just about anything. The problem we have in our microwave society, though, is that we want the quick fix. We want to do one or two actions that will bring immediate success, so that we can move on to another area of our lives and then repeat the process all over again. Could this process actually work? In some areas, maybe, but in many areas of our lives it simply won't. If we desire to improve in our spiritual walk, in our relationships, in our health, and in our work, then we must have consistent daily actions that will slowly move us forward toward our goals. In our ADD culture, it's so easy to get distracted on pursuing the latest and greatest action plan that promises a faster success. Why do you think athletes get lured into taking steroids? It's the faster route. Unfortunately, though, it causes more problems for these athletes in the long run. The same thing can happen in our own lives when we get in a hurry. We want to whip out the sledge hammers, so to speak, to bust through the rocks in our lives. Yeah, the hammer is going to break through the rock, but it's going to cause massive destruction afterward. In order to be successful long-term, we need to focus on the right actions. If we take small, positive action steps each day, this will lead to positive, healthy results. connections or the help of others. This is what consistent daily routines, rituals, and actions will feel like. No quick fix. No excitement here. If you want to be successful in living out a life that pleases God, it's going to take a constant dripping of small, faithful, consistent actions each and every day. Do you want a stronger relationship with the Lord? Then it's going to take the small, consistent actions such as Bible reading, prayer, giving, and church attendance in order to grow in your walk with Him. Do you want to be successful in your vocation or business? Then it's going to take small, consistent actions that will generate connections, business, and clients that desire what you are offering. Do you want to be debt free? Then it's going to take the small, consistent actions of doing a monthly budget, using cash instead of credit, working a little more, and putting any extra money toward your debt instead of buying more stuff. Do you want to have a healthy body? Then it's going to take a daily diet of eating the right foods and a regular routine of exercise in order to stay in shape. Are You Dripping Through Life? So, do you have what it takes to be successful in your life over the long haul? Are you taking those small baby steps each day in order to grow in your walk with the Lord? Are you focused on the right small, daily actions that will lead to a successful calling, career, or business? Are you giving back to the Lord faithfully each and every week through small, consistent amounts of time, abilities, and money? Are you engaged in leading your family in consistent actions that will grow your love for one another and the Lord? What are the constant drips or small actions that you need to focus on today to move forward in your life?